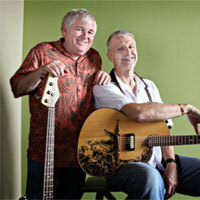 About The Artist: Bass player Keith Grimwood and guitarist Ezra Idlet, together, are Trout Fishing in America. They’ve been playing music together since the 1970s, when they met up in Texas in a folk rock band. In 1979, Trout Fishing was born, and now, 15 albums and four Grammy nominations later, Keith and Ezra still get up every day looking forward to playing music together.